Crabs! What can I say about crabs except that I do love eating this crustacean! I love getting my hands dirty, cracking the claws and getting into the meaty bits. Yum! And when there is great sauce, even better!! 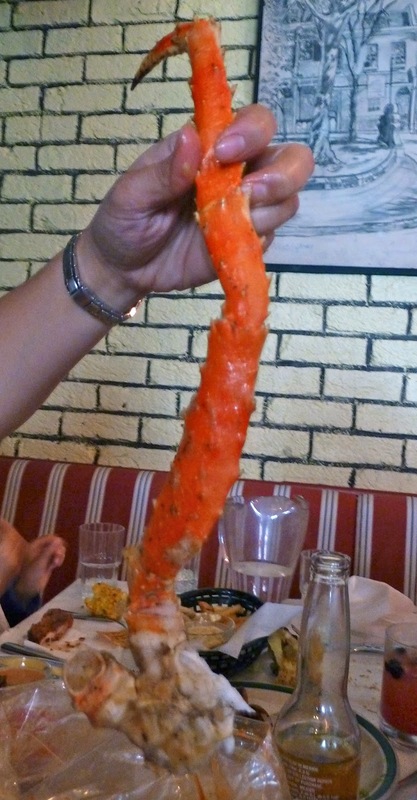 The first time I heard about the House of Crabs was when I saw some photos on Instagram posted by Helen of Grab Your Fork sometime last year. The crabs perked my interest. 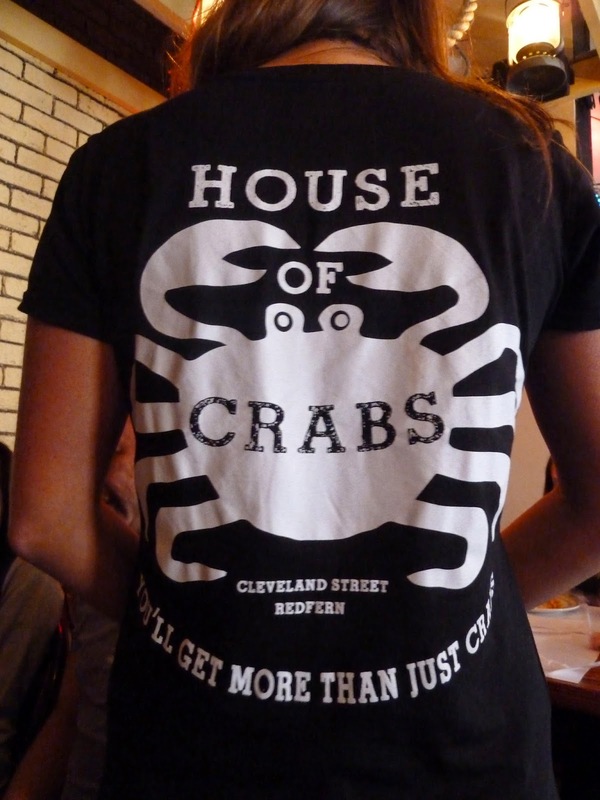 House of Crabs is located on the 1st floor of The Norfolk. As I walked up the stairs I immediately saw all the crab like decor. There was very much a chintzy, schmaltzy vibe to the place. It was long john silver, shanty like with heaps of quirky artefacts! I loved it! Something so different and blasé with its 'in your face' American South shanty feel. I don't know how else to describe it. FYI the seafood is served in a bag and is 500g per serve. These are known as The Boil. The seafood available are Mussels, Little Neck Clams, Prawns, Blue Swimmer Crab, Snow Crab and King Crab. You have a choice of 3 sauces to pick from; Cajun, Mexican and Lemon Pepper. There were no plates to eat out of. The intention is to eat on the table, and the more the table is plied with the remnants, the more enjoyable the meal was! So off we went and ate to our hearts content. The claws from the king crab were amazing! The meat was sweet and juicy. My friends commented on how odd the claws were not hard but soft. That was because the crab was cooked in the bag and was all steamed up. But I enjoyed the crab. I absolutely loved the prawns. They were perfectly cooked, succulent, sweet and oh so delicious. And the Cajun sauce that they were cooked in was nicely spiced and full of flavour. My favourite sauce of all the 3 options. We loved the prawns so much we ordered another 500g! The neck clams were alright. My disappointment was I wasn't very lucky with my selection. I could hardly find any meat in any of the clams I picked. My bad! The fried chicken was so good! I was so surprised that the chicken was as good as this considering we came for crustacean. Lol! I will say that I did not take to the lobster fries. I found it was too salty and had a strange taste, not a natural taste. And for dessert, well we had one choice and are we glad we chose it! Neopolitan ice cream waffle sandwich with Raspberry, almonds and chocolate. Didn't expect it to be as nice as it turned out. I am normally not a fan of waffles but I definitely enjoyed this dessert! But overall, it was an enjoyable meal. Loved getting our hands all dirty and making a mess of the table. How often do we get to do that eh? Glad you made it and the fried chicken is surprisingly good isn't it? So much fun! OMG, I went to a place like this in vegas that was recommended by a friend it was called.. crazy crayfish or something, had so much fun eating out of those bags even though i felt like I was going to get rolled by a bunch of mexicans Lol. Love the post. Love your photos! Hi Leona, thank you so much for visiting and for your lovely comments! :) Getting down and dirty by eating out of the bags and with bare hands was definitely rustic! But oh such fun! Hehe!